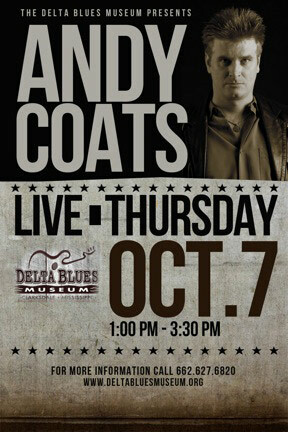 Involved in music since his early teens, Andy Coats has sang and played in rock bands before discovering his calling to the blues. "My passion for this sort of music really came to a head when I was about 25 years of age. I was living in Southern California, struggling through graduate school, and it was then that the magic of the blues masters fully hit me. I dove head first into Robert Johnson's material, listening to it daily." Andy has three CD's released independently and has appeared on the compilation "The United State of Americana", released by Shut Eye Records. Andy Coats was born and raised in North Carolina. Immediately following Andy, the DBM students will be rehearsing in the classroom.